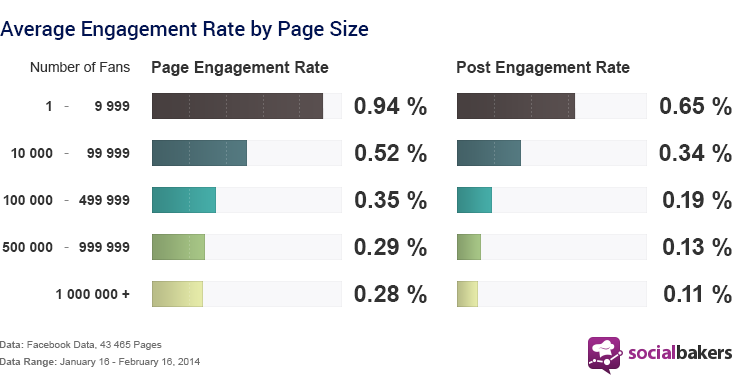 A crucial factor for finding the right engagement rate for your Page is its size and how often you post. A small Page – for example, a local restaurant that posts daily specials and food reviews – might have a more dedicated, close knit group of followers than, say, a massive global brand with millions of fans. The data below shows a steady decline in engagement as Page size increases, and a significant drop once it gains over 9,999 fans. As a Page grows, it’s core group of advocates get diluted and there is an increasing need to put your advertising budget behind your content in order to reach the right group of people. An important metric to consider when evaluating engagement rate, which is often neglected, is the frequency of admin posts. Consider this: the average Page engagement rate is calculated by dividing absolute interactions (likes, comments, shares) by total fans. This means that a Page that posts 3 times a day will most likely have a higher Page engagement rate than a Page that posts once a day. This simple truth justifies the need to measure the average Post engagement rate. This formula (absolute interactions divided by number of posts in a given period divided by total fans) takes frequency into account and paints a smarter picture of engagement. Want to know more about running a big Facebook Page? Industry-wide monitoring of engagement rates exemplifies how some industries are far above others in terms of post engagement. Those that aren't blowing anyone out of the water might want to look into different measures of engagement and see how they are performing according to something like Reach. We looked at engagement rates 7 months ago (a lifetime in social media) and found that the Automotive industry still leads in engagement. With an average post engagement rate of 0.58%, Automotive is 0.1 percentage points ahead of the next closest leading industry, Alcohol. So far, we have looked at two ways to benchmark your Facebook Page’s engagement rate – by Page size and industry. And we have touched on two ways to calculate your Page’s engagement rate – average Page engagement rate and average Post engagement rate. Now we introduce a third metric that is really the holy grail of engagement – Reach Engagement Rate (available to Socialbakers Analytics clients). With the ever-increasing rise of News Feed ads and a Page’s ability to reach well beyond their fans with targeted advertising, the standard engagement rate formula starts to lose power. It becomes clear that we need to consider actual reach and absolute interactions to achieve a more accurate understanding of engagement. The Reach Engagement equation is as follows: absolute interactions (likes, comments, shares)divided by unique page impressions (paid and organic reach). Because data on Page reach is not publicly available, it’s difficult to benchmark your brand based on this metric. However, brands should use Reach Engagement Rate to measure their true performance and gain insight into which content really works for the people they reach. 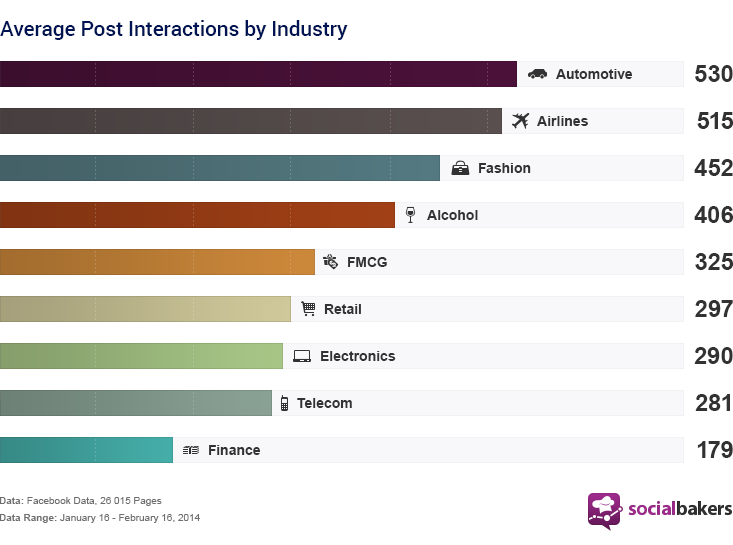 While interactions will vary greatly based on Page size, below are averages for some of the top brands within 10 major industries. 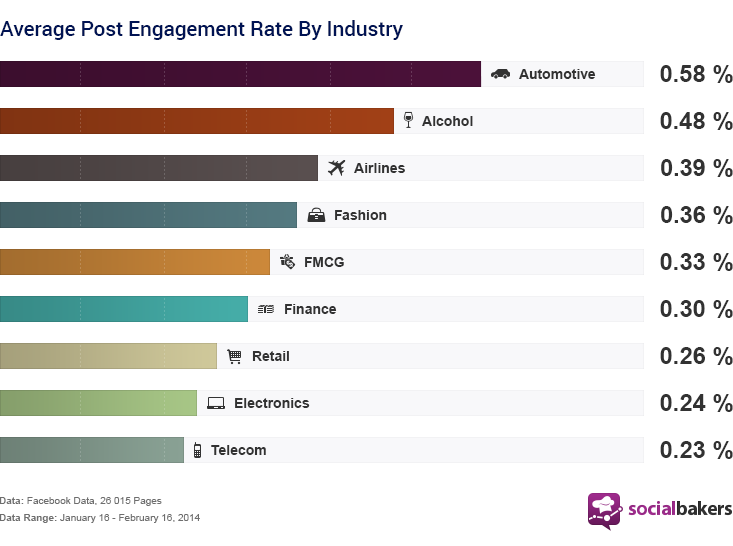 Yes, the rumors are true, engagement is down across the board for brands on Facebook. 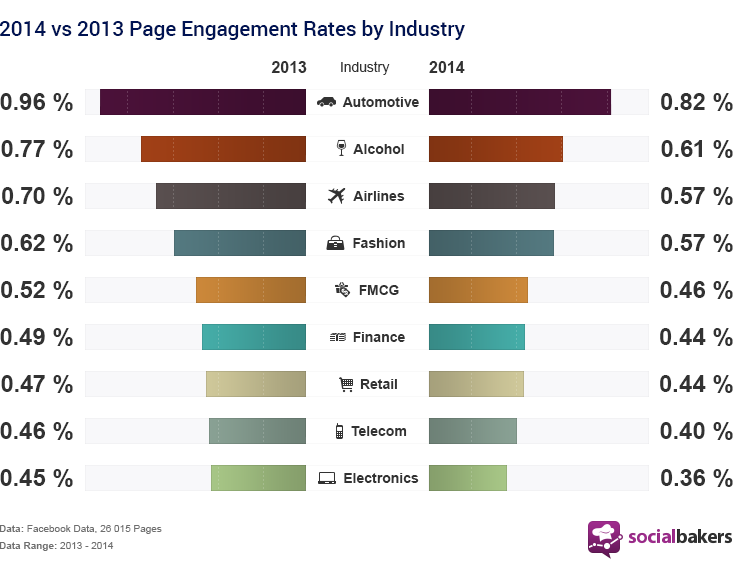 After Facebook announced a change to their News Feed display on December 2nd, 2013 we have measured a clear drop in Page engagement rates for all industries. But these numbers don’t spell Doom’s Day for marketers. As CEO Jan Rezab says, stop complaining about Facebook’s News Feed changes and focus on the real issue: more content, and more Pages being followed means more competition for brands looking to market on Facebook. To learn more about how social media metrics are changing join Socialbakers and other industry leaders at Engage 2014 London, an event by social media marketers, for social media marketers. Remember, if you're not Engaged, you're not a social marketer! Tracking engagement is important, but there are right ways and wrong ways to do it. Due to the ever-changing Facebook News Feed algorithm, many marketers believe the days of organic Facebook reach are over. But while it might be more difficult for your content to perform well organically, it's surely not impossible - and we're about to prove it. Read on to discover ten effective ways to beat the algorithm and improve your organic reach!